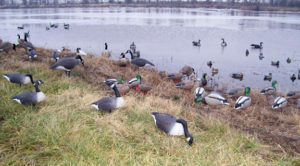 Layout blinds waterfowl hunting over a field set or combination wet and dry spread are yet one more option for the Association hunter. As a do it yourself waterfowl hunting organization, we provide the private wetlands, crop stubble, green wheat and pasture fields to set up layout blinds for both duck and goose hunting. All the hunter provides is the gear.. The birds were scouted working the area the day before. The hunters acquired access to scout and hunt this field by making a telephone reservation to our office, which is open from 9 to 5 Monday through Friday. All of our leased land is mapped and the members have access to the maps online. Crop stubble fields rotate year by year to corn, soybeans and green wheat. Many crop fields adjoin ponds, irrigation, watershed, lakes and managed wetlands. The introduction of layout blind has greatly improved the efficiency of field hunting over the past decade. As technology improves year after year, the game we hunt becomes more educated. Done properly, the low profile ground set up with layout blinds surpasses any method used before. 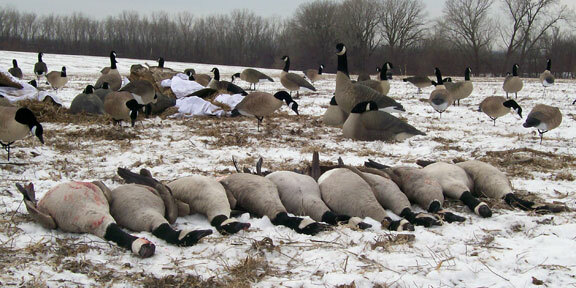 A five-man limit of Canada geese harvested from a bean stubble field. One of those tough days when the ground thawed and the blind and decoys had to be hauled out by foot. Four trips were made to and from the truck, which was parked over ½ mile from the layout blind set. Most waterfowl hunters prefer to set up layout blinds over corn stubble, but in this case the geese were working the area hard. A bean field was the only alternative for the hunters. 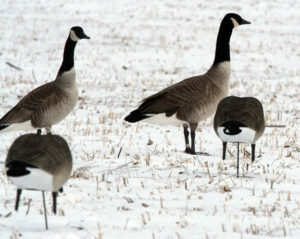 Covering the blinds with white sheets, bean debris and raking open patches in the snow to resemble geese feeding all helped create a successful hunt. Field hunting has always been a “tough” hunt, especially when the ground is muddy and you can’t access your spot by vehicle. ATV’s are allowed to haul gear and vehicles to and from your layout blind sets except for green wheat fields. 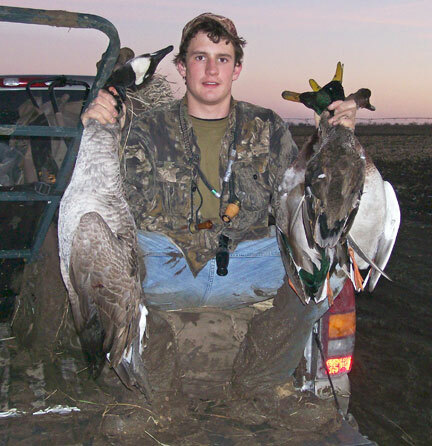 Due to large concentrations of waterfowl, a great amount of field hunting from layout blinds is done by Outfitters on private land close to Federal Wildlife Refuges and State Managed Waterfowl Areas. 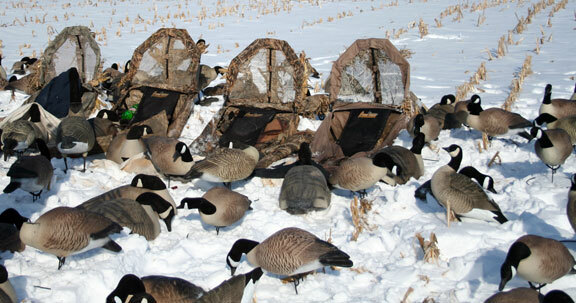 To compete you need a massive set of decoys, which is not affordable to the average hunter. With tens of thousands of acres of professionally managed private leased land to choose from, layout blind hunting opportunity is endless. The season begins early November and runs through March with the spring light goose season. If you are able to take a photo of a banded goose walking through your decoys, it’s a good sign you are hunting land that doesn’t see much hunting pressure.